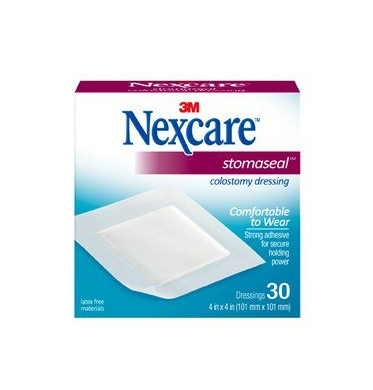 Stomaseal Colostomy Dressing is an Ostomy Dressing made by 3M and sold under the brand name of Nexcare. 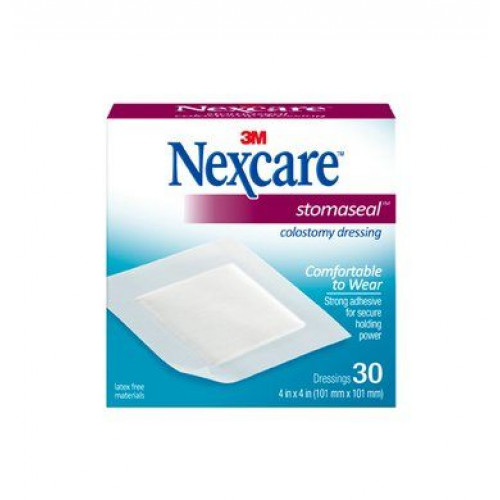 The 3M Nexcare Stomaseal Colostomy Dressing is an absorbent pad for use by individuals with a regulated colostomy. The Stomaseal is a tape supported pad or stoma adhesive dressing that is strong and provides secure holding. The Nexcare Stomaseal Colostomy Adhesive Dressing absorbs 6 times its own weight of body fluid. The durable adhesive tape resists fluid penetration to protect clothing. Although the Stomaseal Dressing adheres tightly, it removes easily. Nexcare Stomaseal Colostomy Dressing is useful for treating mucous fistulas and draining lesions. Strong adhesive that removes easily. Nexcare Stomaseal Colostomy Dressing Product Number: 1507. Size: 4 x 4 Inch. If I ordered a large quantities of your product would you ship to Canada Ontario. We are able to ship to Canada. You'll need to use our international checkout feature in order to complete your order. You'll be able to choose which country and province you want the product to be shipped to from that screen. These bandages are thin, discrete and stick -even in water! Awesome product, and delivery is always prompt! Good product. This bandage is comfortable and stays on until you take it off, even in the water! This company is always on track to deliver-- great service. I've been shopping at Vitality for stoma seals for years, and for the first time I was charged 6.45 for sales tax. This is not called for, and I immediately researched another company that did not charge sales tax. I will switch to that company for my next order. Delivery is always prompt and the order is always right. Was pleasantly surprised at how swiftly my order arrived. Needed something to protect my stoma and this is perfect. Not even aware I'm wearing it!!! It does what it is supposed to, it is a bandage to cover and protect the stoma. The Adhesive is good. These are a good alternative to Stoma Caps during the period when you are not experiencing a lot of output. It does what the names says, it seals off the stoma. I have to use several of them each day. The sealant is just right, sticks good, but not too much.